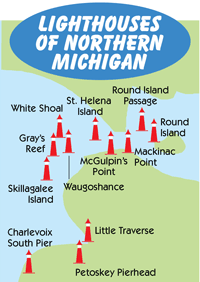 First lit in 1869, the McGulpin Point Lighthouse was a pivotal navigational tool for ships on Lake Michigan. The lighthouse marked the southwestern edge of the Straits of Mackinac entrance and is located on a promontory just west of Mackinaw City in Northern Michigan. The point of land where the McGulpin Point Lighthouse is located was first inhabited by the Native Americans. John McAlpin and his Native American wife arrived at the point in the 1760s. The 640-acre property was the first one deeded in Emmet County in 1811 and was in the name of Patrick McGulpin, son of the McAlpins. By the early 1850s, it was determined that a lighthouse was needed on this spot in the Straits of Mackinac and Congress authorized it to be built in 1854. 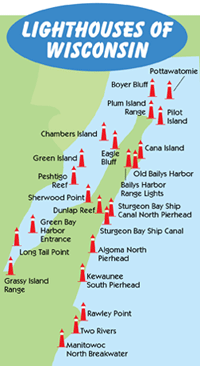 In 1892, another lighthouse was built two miles east of McGulpin's Point on Mackinac Point and was visible by all ships entering the Straits from both the east and the west. The McGulpin Point Lighthouse was visible only for ships entering the Straits of Mackinac from the west so in 1906, just 37 years after going into service, the McGulpin Point Lighthouse was retired. The architectural style of the Lighthouse is octagonal and it is built from yellow brick. The Lighthouse was one of five mirror image lighthouses designed in Norman Gothic style and the tower and keeper's dwelling were built with cream city brick that came from Milwaukee. The building included a full basement which served as an oil storage room and a cast iron, spiral stairway connected the basement to the tower. 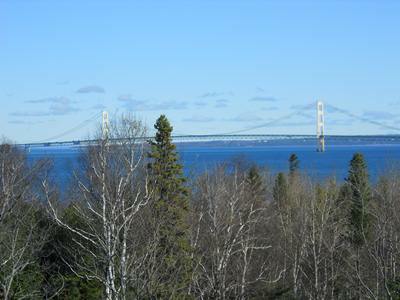 Visitors can climb the spiral staircase to the top of the tower where this is a spectacular view of the Straits of Mackinac and the Mackinac Bridge. The longest serving keeper of the Lighthouse was the Davenport family who served from 1879 to the closing in 1906. 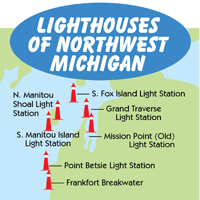 The family lived at the Lighthouse during the navigational season and in nearby Mackinaw City during the winter months. In 2008, the Emmet County Commissioners voted to purchase the property from the Peppler family. Just a year later, the Commissioners purchased property next to the Lighthouse for parking. Restoration work has included a new light in the tower, interpretative displays, and a cell phone tour. A new replica lantern was added atop the tower and lit for the first time at a rededication ceremony in 2009. The summer of 2010 was the first full summer for visitors and more than 10,000 people from through the U.S. and Canada came to see the beautiful lighthouse in an amazing location overlooking the Straits of Mackinac. 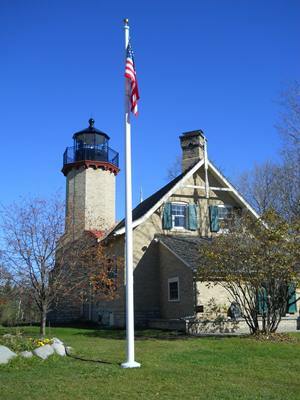 The McGulpin Point Lighthouse is listed on the official "Light List" maintained by the U.S. Department of Homeland Security and the U.S. Coast Guard for the first time since the decommissioning in 1906. Special events are planned throughout the year although the Lighthouse closes for visitors in early November. 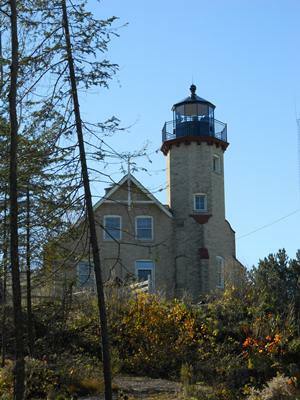 McGulpin Point Lighthouse is located approximately 2 miles west of Mackinaw City. From Mackinaw City, drive west on Central Avenue which becomes C 81 until it ends at Headlands Drive. Turn north (right) on Headlands Drive and the lighthouse is on the right-hand side (look for the signs). Hours: 10am-8pm daily through September; 12-4pm weekends in October. Harbor Point Lighthouse -- Located in Harbor Springs in Northern Michigan. McGulpin Point Lighthouse -- This lighthouse is located in the Straits of Mackinac at Mackinaw City. Old Mackinac Point Lighthouse -- Old Mackinac Point Lighthouse is in Mackinaw City. 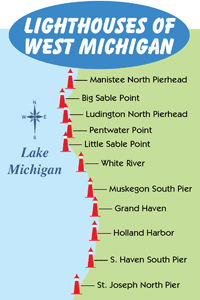 Ludington's North Breakwater Light -- Walk the half-mile long pier to West Michigan's most popular lighthouse. North Pierhead Lighthouse in Manistee -- At the Manistee beach. Little Sable Point Lighthouse -- Located at the Silver Lake Sand Dunes. Big Sable Point Lighthouse -- Located in the Ludington State Park. Pentwater Pier Head Lights -- At the channel to Pentwater Lake. Grand Haven Lighthouse -- The Grand Haven lighthouse is at the mouth of the Grand River. White River Light Station in Whitehall -- Operated by the Sable Point Lighthouse Keepers. Grand Traverse Light Station -- Located on the tip of the Leelanau Peninsula in Northern Michigan, The Grand Traverse Light was established in 1852. Point Betsie Light Station -- Nestled in a dune just south of Sleeping Bear Dunes National Lakeshore, the tower stands 39 feet tall, but with the height of the dune it towers 52 feet above Lake Michigan. Manitowoc North Breakwater - Walk out to the end of the pier to this Manitowoc lighthouse, and wave to the carferry S.S. Badger as the ship passes by. Algoma North Pierhead - This lighthouse can be seen all along the Crescent Beach Boardwalk and is accessible via the pier if you want to venture closer. Kewaunee Pierhead Lighthouse - Located in Kewaunee, Wisconsin...halfway between Sturgeon Bay and Manitowoc along Lake Michigan.